Michael Haneke wanted the environments to be very dark, so many indoor scenes used only practical light sources such as oil lamps and candles. In some of the darkest scenes, where the crew had been forced to add artificial lighting, extra shadows could be removed in the digital post-production which allowed for extensive retouching. Martin: I gave God a chance to kill me. He didn't do it, so he's pleased with me. Fans of Michael Haneke's more morally shocking films such as 'Funny Games', 'Benny's Video' or the draining 'Time of the Wolf' might find themselves surprised by the quieter and slower analysis of evil in his latest work 'Das Weisse Band'. The action takes place in a North German village shortly before the outbreak of the First World War and in structure presents a number of subtly drawn individual characters as they are caught up in a mysterious series of violent events. In the hands of a mere moralist this could be an unbearable few hours. But it's credit to Haneke's skill as a film-maker that we are utterly caught up and absorbed by a large cast of children and adults. One of the on-going arguments in Haneke's films appears to be the origins of human evil, or perhaps more precisely put, individual acts of evil behaviour. Are such acts an individual's responsibility or do they spring from a climate in which particular energies are at work? This is the question Haneke appears to be exploring here (just as was a central question relating to French society in 'Cache'). One of the most disturbing things at the heart of the film is the fact that we do not know why particular acts of evil take place (including the maiming of a disabled child and the beating of a nobleman's son), or even who commits them. However, this is no 'whodunnit', although with its retrospective voice-over from the School Teacher's p.o.v. we are let to believe for a long time that were in a crime/thriller genre. Throughout his body of work so far, Haneke has suggested that looking for the sort of easy answers films and TV all too readily supply is partly responsible for our misunderstanding how violence in society occurs. (Funny Games). 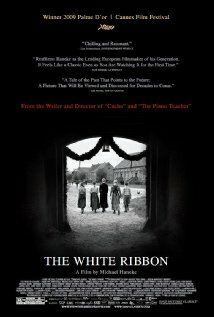 'The White Ribbon' bypasses the usual dramatical devices of motivation and blame and instead softly focuses on an environment (in this case Germany in the first quarter of the Twentieth Century) in which certain unhealthy energies are at work. 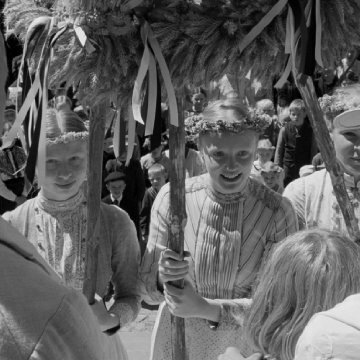 These energies include an emotionally repressed and joyless Protestantism, the mistreatment and oppression of women, the familial abuse of children, the fetishism of strong masculine and patriarchal values, and the un-breachable divide between the rich and the poor. Set over all this, like an umbrella, is the fact that the small provincial society depicted in the film is all but completely isolated from wider society. Another poster here has pointed out that Haneke is using his village as a microcosm to reflect Germany as a whole, and I would agree with that. 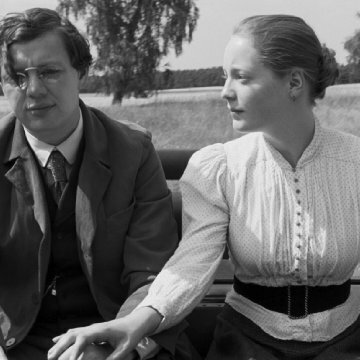 Haneke's Dorf, whilst having an individual character, is a relative of Von Trier's Dogville in the sense that it stands for a larger set of national values. In this respect Haneke seems to be diagnosing German society in the run up to the 'Great' War as one of authoritarianism, religious doubt, intolerance, and fear. What is remarkable in such a film is how little human joy or love is to be found in such a seemingly idyllic rural landscape. The love strand (between the narrator Teacher and the dismissed 17 yr old children's nurse) has a rather strained aspect. It is as though the film maker is suggesting that affection might also be down to available opportunity. 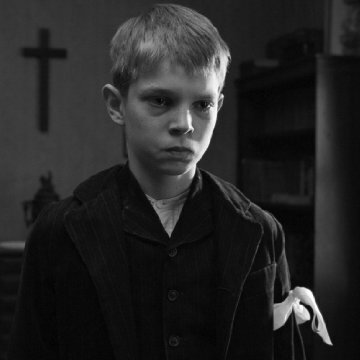 One of the most moving scenes in The White Ribbon is when a young child brings his father, a Priest, a caged bird he has nursed back to health. The father's beloved pet canary was killed (by his daughter as a protest against the bleak, loveless household she's been reared in - a home in which a father shows more affection to a small bird than his own children. Thus the scene symbolically depicts a child demonstrating the love that the parent himself is unable of showing. Tears fill the priest's eyes. It is a tiny moment of love and hope in an otherwise emotionally barren wasteland. 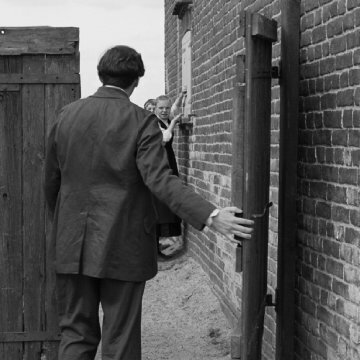 It is also a symbol of how a new generations of Germans have dealt with, and healed, previous decades of pain.